The allied air forces (American and British) in India during the Second World War were always aggressive in their stance. The monsoon rains from June to October might hinder operations, but lessons were learned, airfield surfaces improved and pressure on the Japanese steadily grew. Tactical aviation had been developed in North Africa; it was thereafter adapted to conditions in Northwest Europe, the Southwest Pacific and the India/Burma theatre. It took many forms, including close support of the army and long-range interdiction of enemy supply routes. 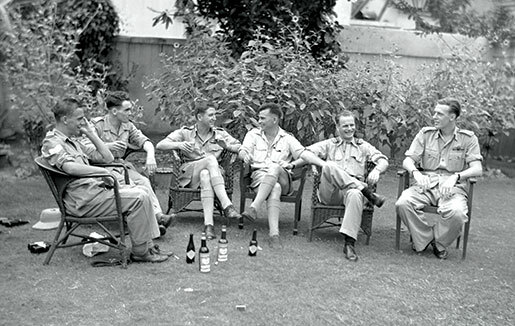 Canadians, including Flying Officer Dave Bruce (second from right) of Kenora, Ont., celebrate Dominion Day in Calcutta, 1944. Effective attacks on Japanese communications forced the enemy to move by night. An intelligence report of September 1944 declared that pilots could easily determine where the front ran. In enemy-held territory, roads, rivers and railways were deserted in daylight, but in Allied-held territory they were all working to capacity. One of the most deadly weapons in the Royal Air Force arsenal was the twin-engine Bristol Beaufighter, dubbed Whispering Death by the enemy. Four 20-mm cannon in the nose meant impressive firepower; No. 211 Squadron added wing-mounted rockets. Beginning in late 1943, they ranged deep into Burma, shooting up anything that moved. Pilots throttled back to reduce noise and increase range. Sorties by Flight Lieutenant Johan Van Nes of Prud’homme, Sask., who served with No. 177 Sqdn. sometimes exceeded six hours, to places with exotic names. In his tour, which ran from September 1943 to May 1944, it was a rare occasion when he did not attack something. His aircraft was also hit four times by anti-aircraft fire. Van Nes was awarded a Distinguished Flying Cross, as was his fellow Canadian, Flt. Lt. Atholl Sutherland- Brown of Victoria, who also published a memoir titled Silently Into The Midst Of Things in 2001. Excerpts appeared earlier in Canadian Military History, Vol. 4, No. 1, Autumn 1995 and Volume 6, No. 2, Autumn 1997. 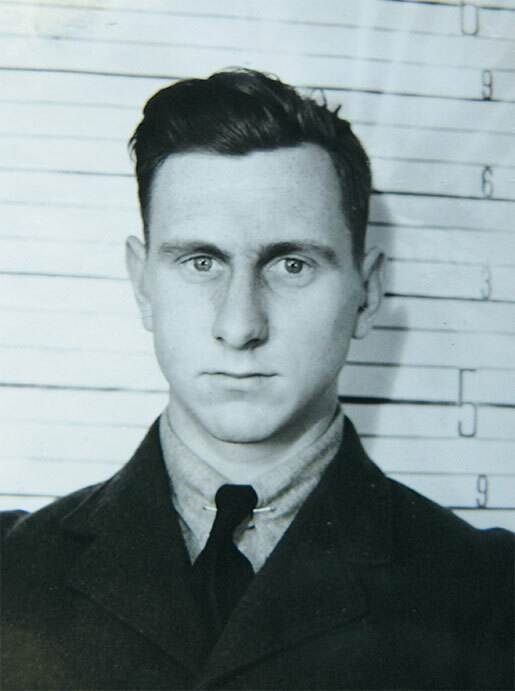 Flight Lieutenant Johan Van Nes at the time of his return to Canada. The greatest hazard was anti-aircraft fire, but low-level flying over rivers added further risks. The Beaufighter manoeuvred sluggishly at the best of times; the hot climate accentuated this trait. Sorties were often flown at dawn and dusk to catch vessels entering or leaving camouflaged anchorages, but the angle of the sun at these times and altitudes worsened the glare on glassy water. We can only guess at the number of Royal Canadian Air Force personnel in the “Beau” units, but one figure is known—those killed: Five in No. 27 Sqdn., five in No. 177 Sqdn., 10 in No. 211 Sqdn. Half of them have no known grave; their names are recorded on the Singapore Memorial. Pilot Officer Ross G. Vaughan of Toronto was typical. He enlisted in August 1941, graduated as a pilot at Saskatoon in July 1942 and went overseas in August. Vaughan underwent further training at British schools that turned out Beaufighter crews, most of whom went to Coastal Command. Pilot Officer Ross Vaughan of Toronto. 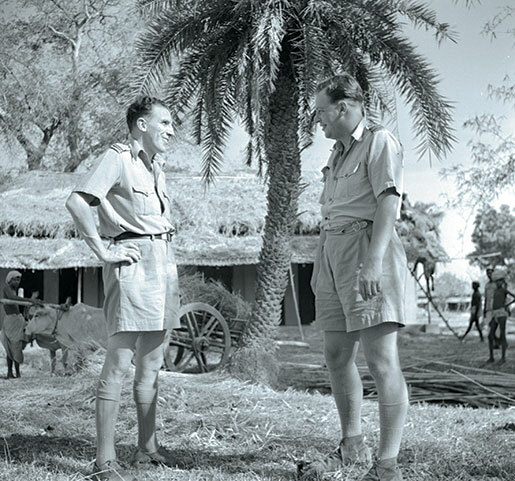 Vaughan was posted to India in May 1943, and joined No. 211 Sqdn. on Oct. 3, 1943. The squadron was just then equipping with Beaufighters, and at least a dozen members of the RCAF were on strength. On Aug. 1, 1944, with a British navigator, Flight Sergeant Alfred H. Lightfoot, Vaughan took off to attack enemy communications in central Burma and failed to return. Precisely what happened is unknown, but today they share a grave in Taukkyan War Cemetery, north of Yangon (formerly Rangoon), Myanmar. More fortunate was Flt. Lt. Mal Haakenson of Berwyn, Alta., who reached No. 211 Sqdn. at the same time as Vaughan. He flew his first sortie on March 15, 1944. This was a rocket strike on a bridge. On his 24th sortie, June 12-13, 1944, he was shot down. Haakenson and his navigator bailed out successfully but were captured. They were held with many others in Rangoon prison until April 28, 1945, when the Japanese abandoned the city in the face of Allied advances. Interdiction went far beyond the range of the Beaufighters. Medium and heavy bombers reached out to attack Japanese sea and land supply routes. Railway lines were especially vulnerable, but harbours at Rangoon and eventually Singapore also came under attack with bombs and mines. In 1942-43 the most common “heavy” bombers were twin-engine Vickers Wellingtons, a type that was being phased out from Bomber Command in Britain. Relatively few Canadians were then in the India-based Wellington squadrons, although at least four were killed with No. 215 Sqdn. between May 17, 1943, and March 3, 1944; the unit subsequently converted to Dakota transport aircraft. As of April 1943 there were at least 20 members of the RCAF in No. 36 Sqdn., which operated Wellingtons in the theatre from October 1942 to June 1943, after which it moved to North Africa. By 1944 the principal weapon in bomber operations was the four-engine Consolidated B-24 Liberator. No. 5 Operational Training Unit (OTU) at Abbotsford, B.C., and No. 111 OTU in the Bahamas were factories for Liberator crews. Pilots were initiated to tricycle landing gear by way of about 25 hours flying time on twin-engine B-25 Mitchells before graduating to the mighty Libs. They then set off for Africa, the Middle East and eventually India. In the final year of the war, half of the Liberator aircrew personnel—1,672—were Canadians spread over 12 squadrons, and 176 were killed in action or flying accidents. Some of their adventures were astonishing. On the night of April 1-2, 1944, No. 159 Sqdn. bombed the main railway station in Rangoon. Enemy searchlights and fighters were active; three of the bombers were damaged. One captained by Flt. Lt. John Gauntlett was fiercely attacked. His British rear gunner was killed and he escaped only by diving from 12,000 to 800 feet. Even so, Gauntlett had to make an emergency crash landing at Chittagong with his fuel almost exhausted. Gauntlett was from Orillia, Ont., but he was actually a member of the RAF, having enlisted in that force while studying history in Bristol, England. Two of his crew were RCAF personnel—the co-pilot, Flying Officer John West of Vancouver and the navigator, FO David Bruce of Kenora, Ont. Both were just starting their tours as Gauntlett finished his. Bruce had his tour cut short on Oct. 6, 1944, when he was shot down and taken prisoner. An action on March 26, 1945, illustrates both the degree of RCAF involvement and the intensity of action. That day, No. 354 Sqdn. sent out six Liberators to co-operate with Royal Navy vessels that had intercepted two cargo steamers escorted by two “submarine chasers” (frigates) in the Andaman Sea. Of the 51 participating aircrew, 19 were members of the RCAF. The Liberators attacked the merchant ships at low level and sank both, but the aircraft piloted by Flt. Lt. William G. McRae of Hamilton was hit by flak; one wing struck the mast of the larger vessel. The aircraft crashed. Two British crewmen were picked up by RN destroyers, but the other seven aircrew—all Canadians—went down with the bomber. No. 203 Sqdn., having toured the Middle East early in the war, reached India in November 1943. It converted to Liberators in October 1944 and took up quarters in northern Ceylon (Sri Lanka). Initially an anti-submarine unit, it switched to bombing operations, commencing March 21, 1945. That day, the squadron dispatched six aircraft to bomb rail and harbour installations in northern Sumatra. Like many Liberator missions in this theatre, the operation was carried out at low level. Four of the six Liberator captains were members of the RCAF. One Liberator, piloted by FO Shirley William Morris of the RCAF was shot down. Pilot Officer Jack Portch of Toronto and Flight Lieutenant John Gauntlett of Orillia, Ont., discuss operations. Flight Lieutenant William McKay of Elmira, Ont., had taken part in No. 203 Squadron’s raid of March 21. On April 11, 1945, he and his crew used initiative to get out of a bad scrape. 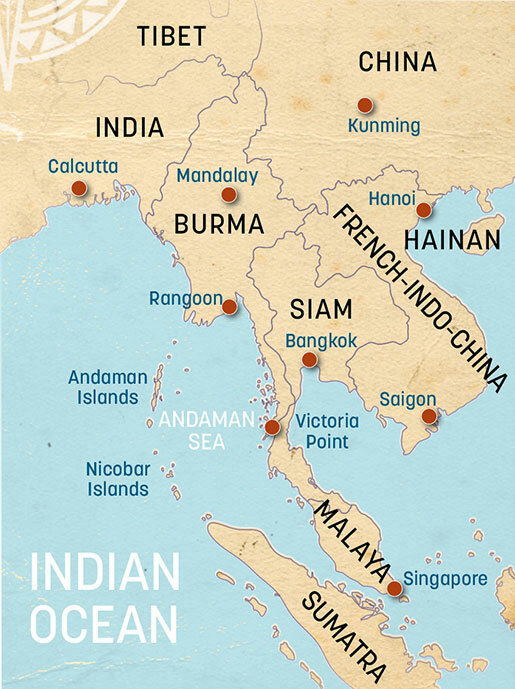 Six of the unit’s Liberators attacked shipping near the Nicobar Islands in the Andaman Sea. They strafed a vessel at 50 feet, then straddled the target with bombs. The enemy threw up a barrage of flak which damaged one engine and the hydraulic systems. McKay flew 800 miles back to base, but he faced the prospect of landing with no brakes. Two parachutes were anchored beside the beam gun positions, and they were deployed just as the bomber touched down. 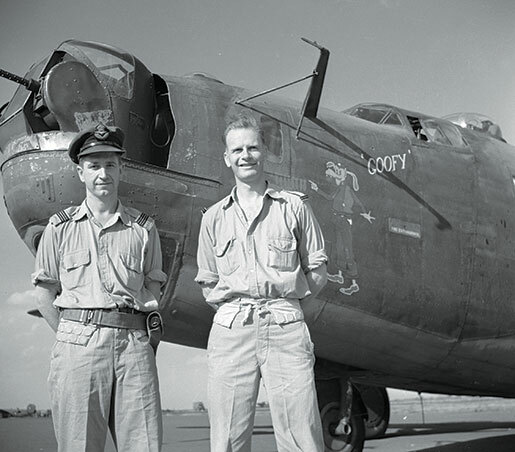 Flying Officer John West (left) and FO Dave Bruce stand before their Liberator named Goofy. The loss of one aircraft usually entailed multiple casualties. Four missing Liberators in No. 99 Sqdn. took the lives of 10 Canadians—seven of them in a single aircraft—between Dec. 3, 1944, and June 5, 1945. From July 23, 1942, to March 22, 1945, 24 Canadians serving in No. 159 Sqdn. were killed in 11 Liberators; these included six lost in a single aircraft on Feb. 9, 1945, and seven on March 15, 1945, again in a single Liberator. In No. 356 Sqdn., 21 members of the RCAF were killed between Oct. 28, 1944, and Aug. 18, 1945, in six Liberators. Hugo Beall of Lindsay, Ont., had enlisted in the RAF in 1936. By January 1944 he was a wing commander and in charge of No. 356 Sqdn., newly formed in Bengal. 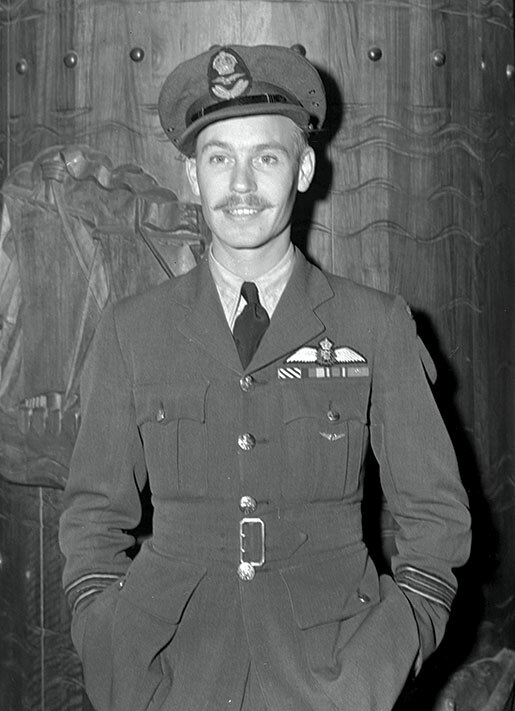 In February 1945 he was succeeded by an RCAF officer, Wing Commander Bryan Sparks of Windsor, Ont., who had joined the unit the previous December. Both men were awarded the Distinguished Service Order for their leadership. The list of targets attacked by Sparks and his fellow Canadians reads like a gazetteer of the theatre. They included four missions against the Burma-Siam railway and three to Bangkok. On March 15, 1945, bombing railway warehouses at Na Nien in northern Indo-China, he was airborne for 15 hours and 20 minutes. Six other missions exceeded 12 hours of flying. Sadly, he died of polio on Aug. 11, 1945. Historian Terry Copp has declared that Canadian military history is not so much “unwritten” as “unread.” For those who would pursue more fully the history of RCAF Liberator aircrew in the Far East, there are several works, from privately printed memoirs, including Peace Persuader, published anonymously about 1995 to an extensive two-volume narrative titled Burma Liberators: RCAF in SEAC by John R.W. Gwynne-Timothy. Regarding your article “Astonishing Adventures In The Far East” by Hugh A. Halliday (July/August 2014), I stumbled on Robert H. Farquharson’s book For Your Tomorrow: Canadians in the Burma Campaign, 1941-1945 on Amazon, which I am now reading as slowly as possible as it is a book one doesn’t want to end. Dieppe, Juno Beach and the Scheldt Estuary were about all I knew of Canadian military history. Curious how the China Burma India Theatre and Canada’s role in it has been missed by such a wide mark.